Many adults wear the evidence of past cavities on their smiles in the form of silver, or amalgam fillings. Today, there is a better alternative: natural looking tooth colored fillings. These restorations are highly aesthetic, less sensitive to heat and cold, and can last just as long (or longer) than silver fillings. Dr. Gary Rosenfeld is pleased to provide tooth colored fillings in Medford. Keep reading to learn more, then schedule an appointment for an aesthetic solution to tooth decay today! Tooth colored fillings are made out of composite resin, a biocompatible material composed of smooth plastic and glass particles. The composite resin fills the hole, or cavity, left by tooth decay. Composite resin is easily customized to match the color of your surrounding tooth enamel, so once your filling has been placed, it blends flawlessly with the rest of your smile. To place the tooth colored filling, your dentist will remove all decay, dry the area, and apply an acidic solution to roughen the surface and encourage bonding between the enamel and composite resin. Because composite resin actually bonds with the enamel, it restores almost all of the tooth’s chewing strength. If the cavity is very small, no drilling is needed to place the tooth colored filling — so it can be completed without any anesthesia if you wish. Unlike silver fillings, which take up to 12 hours to fully dry, tooth colored fillings set within a matter of minutes under a special light. That means you can come into Island Daily Dental Care before lunch, have your tooth repaired, and go out for a bite right after! When compared to silver fillings, tooth colored fillings offer a wealth of benefits. There are the aesthetic benefits, for sure — our patients love that they don’t have to worry about flashing a big gray spot if they have a cavity. But aside from the fact that tooth colored fillings blend beautifully with the rest of your smile, they also actually strengthen your tooth by bonding with the enamel. A tooth colored filling is also less sensitive to fluctuations in temperature, meaning the tooth enamel surrounding the filling is under less pressure from repeated expansion and contraction. When placed by experts like Dr. Rosenfeld and his team, tooth colored fillings can be expected to last for just as long or longer as the amalgam alternative. In addition to filling new cavities, tooth colored fillings can also replace old gray dental work and even make minor cosmetic improvements to damaged front teeth. 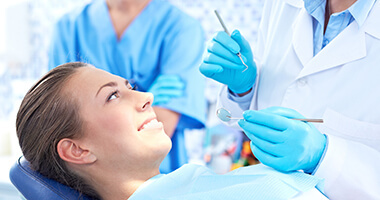 You and your Medford dentist will discuss your options to tailor a treatment plan just for you. If it’s been a while since you visited the dentist, remember that regular preventive care is important for preventing the need for fillings and enjoying a healthy, long-lasting smile. Get in touch with us right away to schedule a checkup and cleaning!